For the third straight winter, snowfall was prevalent in 2010-2011. Most of that snow fell in 5 events during January-February 2011. For the most part, each of the events were well-forecast and dropped "significant" snow (for the South) somewhere in the metropolitan area. 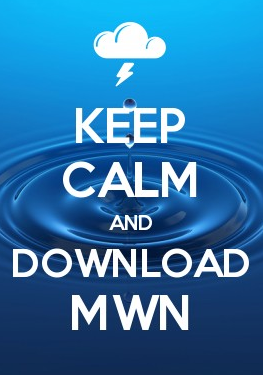 A brief recap of each event follows. January 9-10: The preferred storm track for accumulating snow materialized early in the month as low pressure moved along the Gulf Coast and an upper-level low traversed central MS. Snowfall totals were highest just north of the low as 6-10" fell over north MS. The immediate metro area received 3-4", while areas north of the metro picked up1-2". The graphic at left summarizes the totals (click for larger image). A Winter Storm Warning was issued ahead of the storm and the official total for Memphis was 3.0". 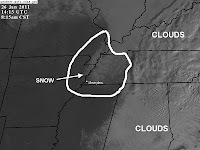 January 20: Ten days later, another upper-level low, this one trailing a cold front, caused rain to change to snow during the afternoon hours, which continued into the evening. Snowfall totals ranged from 1" north of the city to 3" to the south. Memphis International recorded 2.0" for this event. Snowfall totals are shown in the graphic at right. January 25: A very similar setup to January 9 occurred again on the 25th, only with lesser amounts of moisture, thus lower snowfall amounts. Rain changed to snow in the late afternoon and continued through the evening, dropping 1.1" at the airport with higher amounts to the east and north. 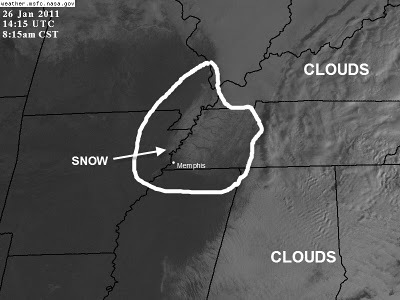 Snow mainly fell over west TN with this event. 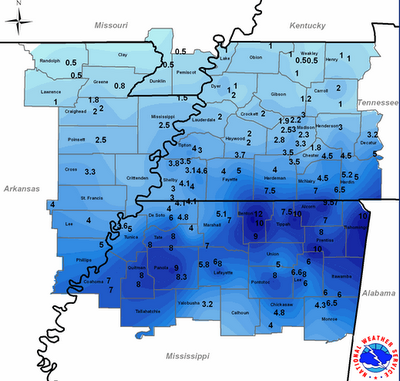 February 7: While most were people were looking ahead to a much larger event due in on the 9th, a quick-hitting system dropped amounts ranging from 0.2" at Memphis Int'l to 1.8" at MWN in Bartlett. 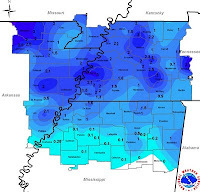 February 9: This well-publicized and well-forecast event once again followed the preferred storm track as low pressure rode the Gulf Coast, pumping moisture into the Mid-South where cold air resided. 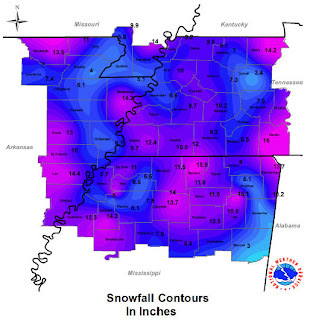 Highest snowfall amounts were again found over north MS and east-central AR where 3-6" amounts were common. 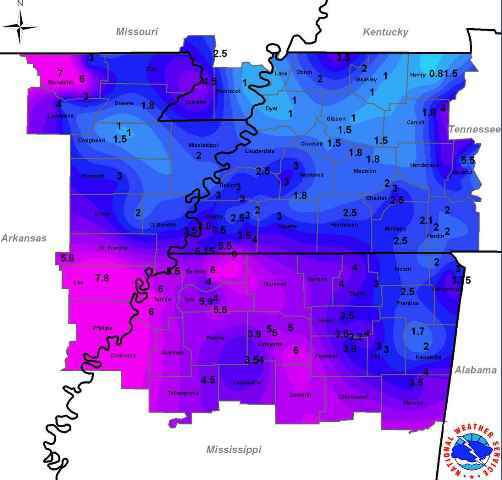 Lowest amounts were found over northeast AR and northwest TN. In the metro, amounts were consistently in the 2-4" range, including 3.1" at Memphis. By the end of the the winter, Memphis Int'l had recorded 9.7" of snow for the season, 6.1" over the normal of 3.1" and the most since the winter of 1987-88. In addition, there were 6 days with measurable snowfall, the most since 1984-85. Mid-South snowfall totals for the winter are shown in the graphic below. Many Mid-Southerners like to complain about the heat and humidity of the summer. Many are transplanted northerners, others tolerate it for different reasons. And while an average Memphis summer can be "sho'nuff" hot and humid, the summer of 2011 left even the most tolerant of us begging for 24x7 A/C - and for good reason. 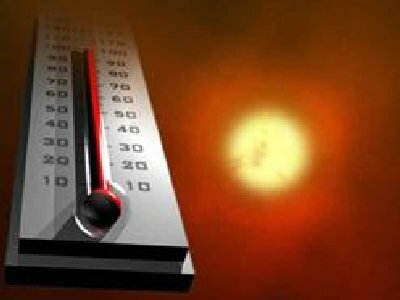 By the first week in September, the National Weather Service had officially placed the summer of '11 in the record books as the third hottest behind the previous year (2010) and the benchmark for Memphis summers - 1980. In fact, three of the past five summers, including 2007, are ranked in the top 5 hottest of all time (records go back to the 1880s). The average temperature for this summer (meteorologically, June-July-August) was 84.6 degrees, which was 1.0 degree off the record summer of '80. Several daily records were broken, including the record high of 106 on August 3, which fell 2 degrees shy of the all-time heat record set on July 13 in the storied year of 1980. A few other sweltering stats about this summer: 10 daily heat records were set or tied; the average high and low in July was 95 and 77, respectively; and only 10 days during the three-month period failed to reach at least 90 for a high (five of those in mid-August). The heat started early with three records of 99 set in the first week of June and the June-July period tied 1980 for the hottest ever at 84.9 degrees. For more details on each month's climate data, click these links: June July August Besides the heat, humidity levels were also abnormally high, even by Memphis standards, for long stretches this summer. Heat indices soared above 110 and overnight lows failed to drop below 80 on several occasions, prompting Excessive Heat Warnings for the area. With two summers in a row making the top 3, we're due for a cooler summer in 2012! This leaves only the top 2 stories remaining! What events topped one of the snowiest winters in recent memory and the third hottest summer ever? Find out tomorrow as we conclude the "Top 11 of '11!"